The check's in the mail? The tundra has long turned through gold and red to autumn brown, and there�s no doubt that we are headed toward another Nome winter. The odds are good that by the time you receive this, we will have seen our first light snowfall. Please accept our most sincere thanks for your generosity to our mission. Your prayers and your financial support keep our work alive and strong, beaming our award-winning signal of inspiration and education across more than 100,000 square miles of western Alaska. May God bless you for your help! top BERRY GOOD! 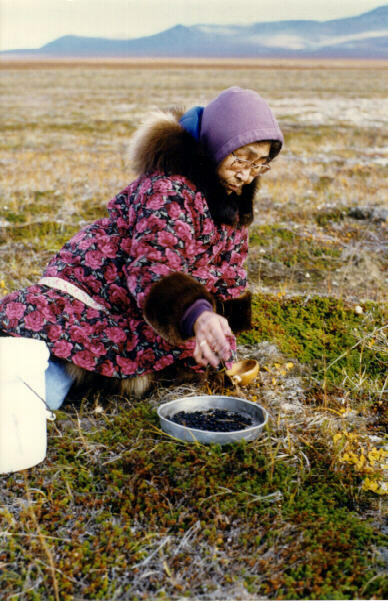 (Left) Rose Koezuna picks blackberries on the tundra northwest of Nome. Born on rugged King Island, which is about 80 miles up the coast, Rose is among thousands who harvest wild berries. Most popular are low tundra blueberries (smaller and more tart than their commercial cousins), salmonberries (a pungent fruit the size of a raspberry with the brilliant orange color of salmon meat), blackberries and cranberries. They all grow wild along hillsides for hundreds of miles. Watch out though: they�re also favorite fare of grizzly bears! Some families pack away more than ten gallons of berries a year, which can be their primary source of Vitamin C.
A first grade class was talking about adoptions. One girl raised her hand and proudly announced she knew all about adoptions. After all, she had been adopted. "Being adopted," she said, "is when you grow in your mommy�s heart instead of her tummy!" Full size VISITORS: We were delighted to spend time with former visiting Nome pastor Fr. Gerald Ornowski, MIC, as well as Fr. Casimir Chivalek, MIC, who is Vicar Provincial of the Marians in the United States, and Very Rev. Adam Boniecki, MIC, Superior General of Marians of the Immaculate Conception in Rome. Father Boniecki was on a tour of Marian foundations in the U.S.
Nome Pastor Father John Hinsvark (left) celebrates Mass in Nome�s St. Joseph�s Parish. Father John is a longtime Alaskan missionary. He also ministers to the parishes in the village of Teller and remote Little Diomede Island. Those travels leave Nome without a priest about 50% of the time. KNOM airs the 10:30 AM Sunday St. Joseph�s Mass when Father John is here. When he�s gone, KNOM still offers our isolated listeners a broadcast of the Mass, thanks to the Passionist Fathers of New York, who provide us with their broadcasts at no charge. We air this Mass at 8 AM. When there�s no local Mass, we air a repeated broadcast of the Passionist service, beaming Mass twice each Sunday throughout vast western Alaska, and well into Russia as well. INSPIRATIONAL SPOT: The carpenter�s Son had hands callused and worn. These hands held the sacred scripture in the temple, hammered the wood in the workshop, carried water for His mother. Ordinary, everyday things for extraordinary hands. Jesus, Carpenter of Nazareth, may the work of my hands help sanctify me. the snow will simply blow through. Les, who was a KNOM volunteer in the early years, 1972-73, has spent his last ten years� vacations helping rebuild the mission, and has worked fulltime at the mission since his retirement last year. 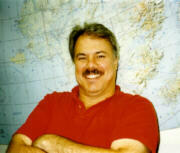 He�s a broadcast engineer by trade, though KNOM listeners enjoy the rich tones of his deep bass voice..
(UNLESS �THE CHECK�S IN THE MAIL�) we still have not found an "angel" to underwrite our $16,000 effort to increase listening awareness by sending 200 high quality antenna boosters and 200 super-sensitive radio receivers into villages. We�ll report back to you next month on progress toward our needed dubbing station. Thank you for all of your sacrifices on our mission�s behalf. INSPIRATIONAL SPOT: Sometimes the poorest man leaves his children the richest inheritance. top THIRTY YEARS AGO: September 1968, KNOM Founder Fr. Jim Poole, SJ, commented that his mother Luella was "cooking reinder in so many different ways she could qualify for an army camouflage school." Reindeer was the only meat regularly served at the mission in those days, thanks to a herder who donated a side of meat every now and then. For dinner, volunteers ate reindeer roasts, reindeer steaks, reindeer stew, reindeer burgers, reindeer goulash, reindeer-noodle casseroles, most meals served with rice or dried potatoes and canned vegetables. Lunches included canned tuna fish, canned soup and cornbread, plus leftovers (which were mostly reindeer!). (Left) KNOM Program Director Ric Schmidt takes a short break in the front office. Ric was a KNOM volunteer in 1984 and 1985. Later, he was hired to be the General Manager of KBVM-FM in Portland, Oregon, a Catholic radio station which he managed for seven years before moving back to Nome and the KNOM mission. Ric supervises the volunteers and organizes all programming. He brings great talent, energy and experience to our mission. Ric and his wife Lynette, who was also a KNOM volunteer, are raising six children, whose voices can often be heard on a range of KNOM educational and inspirational spots. In August, Nome�s "Bering Strait Record" newspaper wrote a page-long article on KNOM�s 3rd-in-a-row Gabriel Award, and we were front page news for the Anchorage Archdiocese�s "Catholic Commentary." We have a limited number of copies of these articles. If you�d like one, please ask! INSPIRATIONAL SPOT: Forgiveness is the perfume that the trampled flower casts back to the foot that crushed it.. RUSH! RUSH! That�s what the early gold seekers said a hundred years ago, and August 21st brought Senator Ted Stevens, the Postmaster General of the United States, William Henderson, and a host of other dignitaries to Nome for a gala first day of issue of a "Klondike Gold Rush" 32-cent stamp. Although the Klondike is over 1,000 miles from this little burg, Nome was chosen for the stamp�s release. KNOM broadcast the stamp�s hour-long dedication ceremony, and it was the talk of the town. HAMMING IT UP: Congratulations to KNOM Business Manager Florence Busch, who "aced" the examinations and is now licensed amateur radio operator KLØQC. Yay! Meet new KNOM volunteer Kelly Brabec (right), who arrived in Nome August 1st, and is already hard at work as the radio station�s Assistant Music Director. Her job is to carefully review and schedule all of KNOM�s on-air music. From St. Paul, Minnesota, Kelly is a 1998 graduate of the University of St. Thomas with a major in electronic media production. She�s 22 years old. Eventually, she�d like to work on a film or television production crew. For the time being, though, Kelly�s happy to be volunteering for KNOM. She�s in Nome "to serve, to be involved, to experience a new way of life." And, Kelly says, "I love it here. The people at KNOM are so nice. Everyone is willing to help out." Were there any surprises? "I�m really taken by the energy at the radio station, and how dedicated and easy going everyone is." When she�s not working, Kelly enjoys basketball and softball, painting and writing. We thank God for sending us wonderful volunteers like Kelly. Please join us in extending her a warm welcome! God, grant that I may fish until my dying day. And when it comes to my last cast, I most humbly pray, when in the Lord�s safe landing net, I�m peacefully asleep,that in His Mercy I be judged as big enough to keep. top ONE HUNDRED YEARS AGO: September 22, 1898, a trio known as "The Three Lucky Swedes" (though one was Norwegian), discovered gold at Anvil Creek about five miles northwest of Nome, and the rush was on. The following spring brought a frenzy of miners from the Canadian Klondike, and within two years, Nome was a thriving metropolis, with as many as 40,000 people in the area. Despite all the hopes of striking it rich, most would-be millionaires wound up working shovels for big mining outfits, earning room and board, plus a return steamship ticket to Seattle. As you can imagine, the town of Nome is planning "big doin�s" to celebrate its centennial, and KNOM�s microphones will be there. KNOM brings God�s Love into thousands of scattered homes throughout roadless village Alaska, with 24 hours a day of inspiration, education, news, information and companionship. 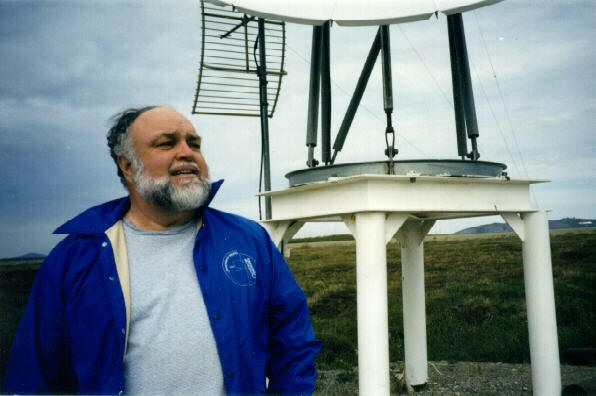 Our 25,000 Watt AM signal is by far Alaska�s strongest outside of the city of Anchorage, 530 miles distant. Thank you for making our much-needed and award-winning work possible. May God bless you!